"God is infinitely more interested in our having a place in His kingdom than with our spot on a mortal organizational chart. We may brood over our personal span of control, but He is concerned with our capacity for self-control. Father wants us to come home, bringing our real resume, ourselves! "Yes, we are free to choose the mortal perks with their short shelf life. However, ahead lies that great moment when every knee shall bow and every tongue confess that Jesus is the Christ! (See Mosiah 27:31; D&C 88:104). Then the galleries and the mortal thrones will be empty. Even the great and spacious building will fall—and resoundingly! (see 1 Ne. 8:26-28). Then, too, those who have lived without God in the world will confess that God is God! (see Mosiah 27:31). Meanwhile, His character and attributes should evoke adoration and emulation from us. "Isn't it marvelous, brothers and sisters, that God, who knows everything, still spends time listening to our prayers? Compared to that cosmic fact, what does the world really have to offer us? One round of applause, one fleeting moment of adulation, or an approving glance from a phantom Caesar? "May God bless us to see things as they really are and as they really will be (see Jacob 4:13; D&C 93:24), and may we give the glory and honor and praise unto God." 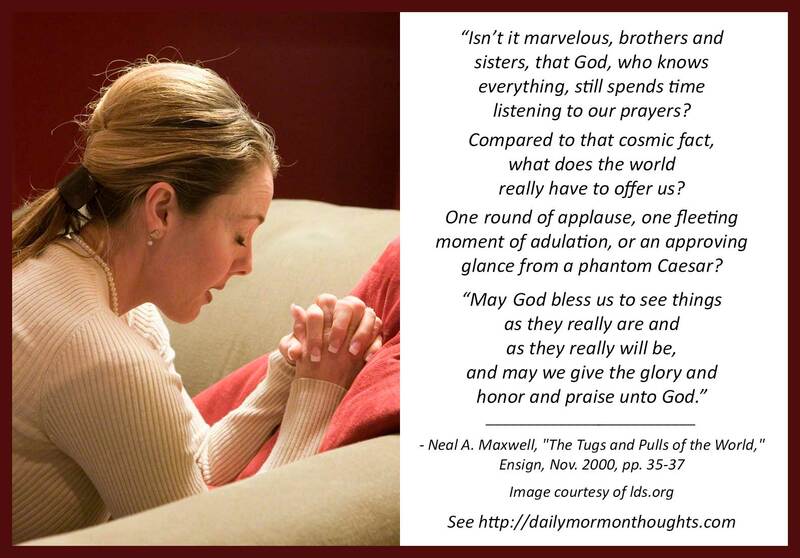 This is a classic message by Elder Maxwell. The talk's title explains the theme: how the world tries to pull us away, to distract us from what really matters in the eternity scheme. One of those "tugs and pulls" for many people is the desire for public recognition. We want to be high on the chart, with the power and prestige that accompany the position. 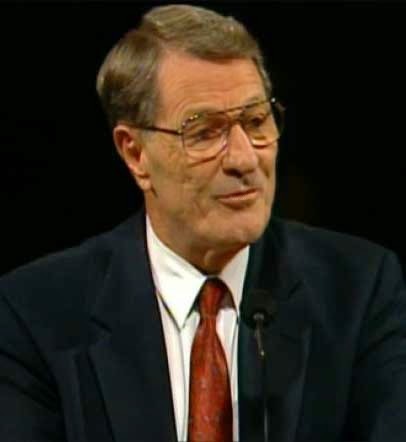 But Elder Maxwell explains that such "mortal perks" are fleeting and short-lived. It's the ultimate, eternal, divine recognition that matters more. "But before ye seek for riches, seek ye for the kingdom of God. "And after ye have obtained a hope in Christ ye shall obtain riches, if ye seek them; and ye will seek them for the intent to do good—to clothe the naked, and to feed the hungry, and to liberate the captive, and administer relief to the sick and the afflicted." Just as a person with a solid foundation of faith might desire riches in order to bless others and further the work of God's kingdom, so he might desire leadership opportunities or chances to help direct the work with the same motivation. Following God's example of service and love will always keep us on the right path to eternal progress.